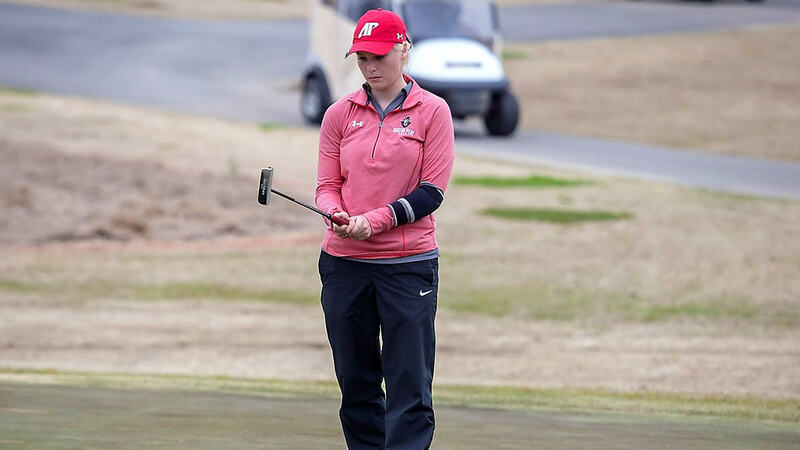 Murray, KY – A trio of top-20 finishes, including a top-five showing from sophomore Meghann Stamps, has Austin Peay State University women’s golf eying a third top-five finish in its last four tournaments, this one at the Murray State Invitational at Miller Memorial Golf Course. The Govs are one shot behind the host Racers, sitting in third after 36 holes that saw the Govs shoot a 598 (297-301); Central Arkansas leads at 584, with ULM (602) and Arkansas State (603) rounding out the top-five. Stamps opened up with a career-best 71, backing it up with a 77 for a 148; she’s tied for fifth with 18 holes to play, thanks in no small part to a 4.05/hole average on par-4 attempts and her team-high five birdies. Playing as the No. 4 and No. 5 in the lineup, junior Taylor Goodley and senior AnnaMichelle Moore more than held their own, tying for 20th thanks to matching 151s. Goodley (76-75) is tied for the tournament lead in par-3 scoring (2.88/hole), while Moore (73-78) was one of three Govs to can 23 pars on the day. Rounding out the lineup for Austin Peay were juniors Reagan Greene (77-76—153; t-29th) and Ashton Goodley (81-73—154; t-34th). Goodley led the Govs and was second in the entire field with 26 pars, but it was Greene’s performance on the par-5 No. 17 that stole the show; the Clarksville native sank the lone eagle in the entire tournament on her second-round attempt, accounting for her team-best 4.75 average on par-5 attempts. Freshmen Riley Cooper and Andrea Presilla made the trip and performed admirably as individuals; Cooper showed a seven-stroke improvement in the second round (86-79—165; t-70th), while Presilla made her season’s fifth start, shooting 174 (85-89; 85th). Final-round action from Miller Memorial Golf Course commences at 11:00am, Saturday, with 18 holes remaining.